Cooking with yeast is not my thing. However, eating food made from yeast is definitely my thing. 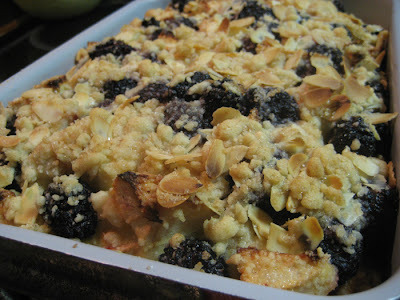 Especially Nigella's apple and blackberry kuchen - a sweet yeasted dough, enriched with eggs and topped with blackberries, apples, and a crumble mixture. A quiet weekend in Germany gave me the opportunity to test out some of my (still developing) yeast-baking skills. 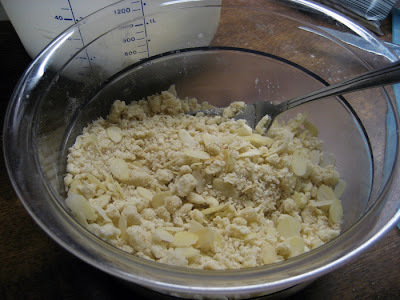 ..., which contains, in addition to flour, salt, sugar and yeast, some eggs, vanilla, lemon zest, milk, butter and cinnamon. I'm sure you can imagine how divine the fragrance is..
Once it's risen (overnight in the fridge, or an hour in a warm spot), it will be soft and springy and doubled in size. 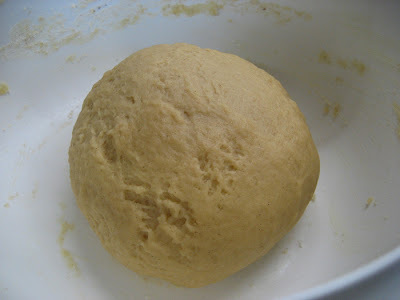 My photos make them look the same size, but rest assured, the dough did actually expand. Can you see the stretch marks at the top of the ball? 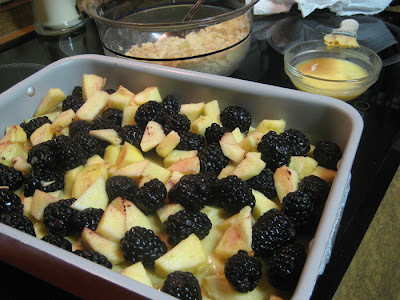 Once it's risen, you stretch out the dough into a 9x13 inch pan, glaze it with egg-wash, and cover it with fruits and crumble. 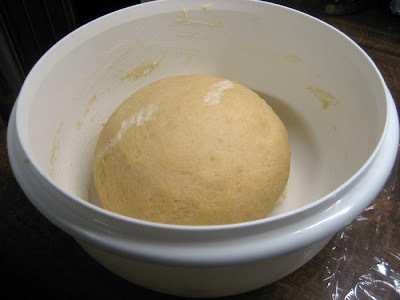 Once it's baked, it will be risen and divinely fragrant. 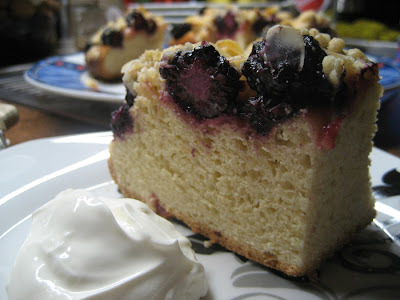 It's supposed to be eaten as breakfast, but we had it for afternoon tea with crème fraîche. (It's only 79 euro cents for a tub! Blackberries were cheap there too. *Sigh*). You'll also be able to see from the picture, that it's quite high. It's supposed to be a thinner, burnished and brown slab, but mine turned out high and slightly doughy, although not unpleasantly so. I realised later that the ruler I used to measure the tin was a technische Zeichnerin (technical draftswoman) ruler, which measured increments slightly smaller than inches, undiscernable to the naked eye. Or I just wasn't looking closely enough. Whoops! At any rate, the finished product was really good. We ate about half of it, and I carefully sliced up the remainder and wrapped it up in foil to freeze. Come to think of it, my host family might still have some slices in their freezer! Frau Margit, bitte schicken sie mir kuchen! Hey I've made this one too, it's sooo good! I've also made the rhubarb crumble one from HTBADG, can highly recommend it :) Yours looks beautiful, the apples and blueberries look gorgeous together. I found that the base went quite dry after a while though...luckily stuff like this never really lasts long LOL.